A rail company responsible for a train which overshot a station by two-and-a-half miles has been fined £65,000. The 06:45 Southeastern commuter service from Charing Cross to Hastings overran Stonegate station in East Sussex by 2.4 miles (3.9km) on 8 November 2010. Maidstone Crown Court was told it was effectively out of control for 3.2 miles (5.1km) from when braking began. The rail company admitted two charges under two sections of the 1974 Health and Safety at Work Act. 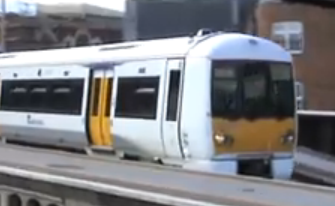 Southeastern was also ordered to pay £22,589 in costs. The incident happened just after 08:00 GMT despite the driver applying emergency braking. The court was told it happened because the train did not have any sand on board to help with braking in poor weather conditions. Prosecutor Richard Evans said inadequate logging procedures and a lack of communication between Southeastern employees had meant the train had travelled 929 miles (1,495km) after a sand refill report was generated. He said the the train was likely to have had no sand on board for about two days when it overran Stonegate station. The court heard leaf mulch on the line meant conditions between the steel rails and train wheels were much like "oil on a non-stick frying pan". Neil Garnham QC, representing Southeastern, said even if everything that should have been done had been, the train would still have overshot Stonegate station by up to 0.8 miles (1.28km) because of poor rail adhesion. Judge Andrew Patience said he was disturbed by the fact there had been no warning system in the cab for the driver and it was only down to good fortune there had been "no loss of life or limb" or serious damage to property.